• When dry lubrication is required. Poor lubricant maintenance is one of the most common failure points for bearings. A properly sealed and lubricated bearing should result in trouble-free field service in theory. Unfortunately, this is rarely the case. Greased joints may not be maintained properly, resulting in boundary/mixed lubrication condition and diminished bearing life. Bearings are often greased only twice in their life, once by the OEM and once before they are sent back for the warranty claim due to bearing failure from lack of lubrication. The total cost of ownership for a bearing that must be lubricated is greater than the total cost of a self-lubricating composite bearing. Most OEM’s clients have found that the cost of purchasing, assembling, and maintaining a greased bearing joint is at a minimum 1.5 times to a maximum of 4 times the cost of a self-lubricating bearing joint. Equipment rental yards are increasingly sensitive to the liability associated with greased bearings. External lubrication is an uncontrollable design variable for OEM engineers. Once the finished product is shipped to the customer they must properly maintain the bearing assembly. Failure can lead to liability or warranty claims. If proper maintenance is a concern, the best solution is a self-lubricating composite bearing. Self-lubrication is the ideal solution since it fully lubricates the contact surfaces requiring absolutely no field or long term maintenance. Dry lubrication does not attract dust or dirt. No environmental contamination from oil or grease. Today’s OEM engineer has many bearing alternatives to choose from. When making a design decision, it can be difficult to weigh material choices for your design. The most obvious difference, greased bearings require perpetual greasing, adding both material and labour costs to the product. When the lubricating film fails due to contamination, the bearing will prematurely wear. Performance of this bearing is entirely reliant on the end user properly maintaining and servicing the bearing joint in question. A design engineer must continually search out materials that increase performance capabilities while reducing total product life costs. 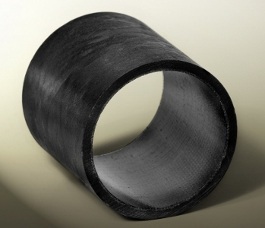 Macplas Composite Journal Bearings “MAC-CJ’s use continuous fiberglass filaments incorporated into a proprietary epoxy resin matrix for a very high strength bearing that is naturally concentric with no seam or overlap. This high strength laminate construction allows for a thin wall (2.5mm to 5.0mm) bearing, reducing the size and weight of the assembly. The resulting bearing exhibits a very low coefficient of friction coupled with high load-bearing capacity. How does MAC-CJ’s lower total cost of operation? The total cost of ownership for a bearing that must be lubricated is greater than the total cost of a self-lubricating composite bearing. Most OEM’s clients have found that the cost of purchasing, assembling, and maintaining a greased bearing joint is at a minimum 1.5 times to a maximum of 4 times the cost of a self-lubricating bearing joint. The MAC-CJ MRP bearing can withstand static loads of approximately 480 MPa and 206 MPa under dynamic loading. For dry running applications, the maximum speed is approximately 3 surface metres per minute. The typical average design pressure for high duty cycle applications is 69 MPa. These conditions ideally suit high load, slow rotation, pivot bush type applications. This bearing’s operating temperature range is ±162°C. Maximum continuous operational surface temperature for the standard formulation is 162°C, depending upon load characteristics. The bearing has been heat stabilized at these temperatures, so that little dimensional change will occur in the bearing during operation. In a free state, the coefficient of expansion of the MAC-CJ MRP bearing is approximately 7 x 106 mm/mm/°C, similar to the coefficient of expansion for steel, and actually less than some metals.